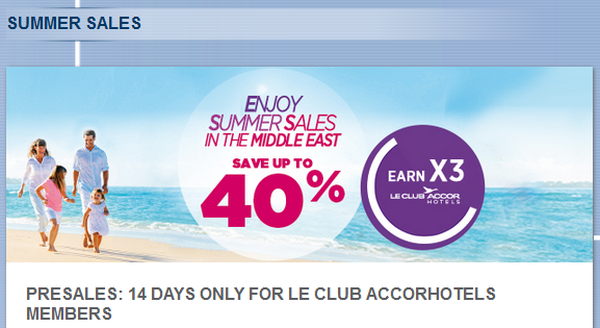 Accor has a new offer for Le Club Accorhotels member stays this summer in the Middle East between June 1 and September 15, 2014. You can get 40% off + another 10% for Le Club Accorhotels members, triple points, breakfast and $10 daily credit towards charges at the hotel. The terms and conditions indicate that this offer should be bookable from May 1, 2014. I tried to make a rate search, but the web form keep returning an error message that the identification would have been invalid. Summer in the Middle East is REALLY hot and unless you are used to weather in the 40’s Celsius it is not the best time to visit the region. I am not sure what is up with Accor’s website. The Bangkok offer that I posted the other day gave the same error message, but the rates did come up on the regular search as well.